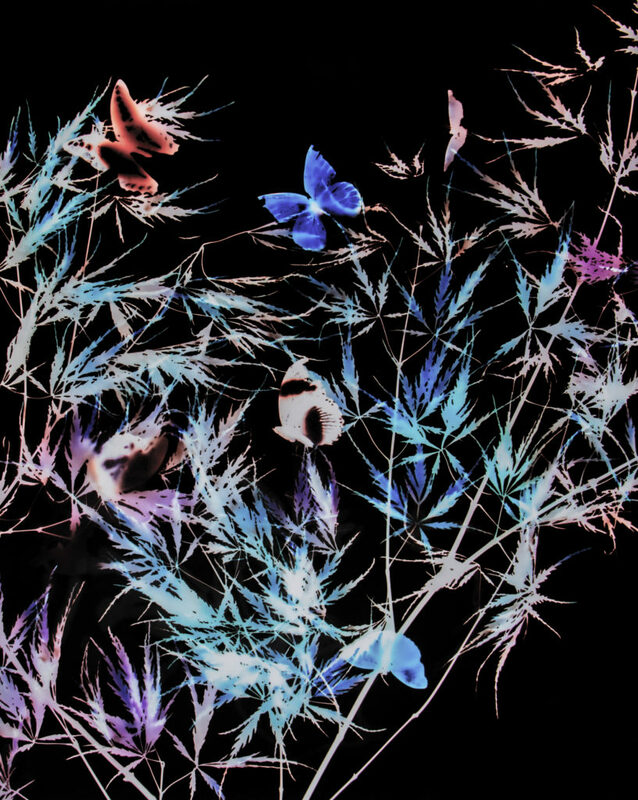 Photofauna Floragrams | Jennifer Formica | Patchogue Arts Council, Inc.
Now on view at the Patchogue Theatre for the Performing Arts is Photofauna Floragrams, a solo exhibition featuring the artwork of Jennifer Formica. The artwork is taken from Formica’s Photofuana Floragrams series, which consists of one-of-a-kind photograms. The series explores the hidden beauty and structure of natural elements ranging from insects to plant life. Photogram, as a medium, has existed since the late-19th century and is a photographic method where an artist records his or her subject matter with light. As explained by Formica in her artist statement, the organisms are arranged on a piece of photographic paper and exposed to light from above. As the light passes through the organisms, it leaves an imprint on the paper. Once the paper is processed, the artist reverses the markings through colors and tones. The final images capture a more obscure and painterly depiction of the subjects’ structures that occupies the space between abstraction and representation. Representative of this artistic process is Untitled #1. Here, fauna and flora imagery is arranged against a pitch-black background. Compositionally, the flora is situated in a manner to make it appear as if it is sprouting from the bottom of the print before it extend and reaches out across the majority of the picture plane. At least four butterflies are readily visible on a brief glance, with others possibly hidden deep in the sections that are heavily vegetated. The imagery is rendered in a captivating display of blues, purples and reds, all of which are in various degrees of tonality. The subject matter is clear, but it may take some time to identify the specific species exhibited by the artist. Jennifer Formica is a photographic artist from Brooklyn, NY. She received a BFA in Photography from Hartford Art School, University of Hartford in Connecticut and a MFA in Photography from the State University of New York at Buffalo. Her work has been exhibited across the United States and abroad with select exhibitions at the Islip Art Museum in East Islip, NY; Gallery 138 in New York, NY; and Khaki Gallery in Boston, MA. Colored photographs by the artist have been published in Robert Hirsch’s books Light & Lens: Photography in the Digital Age and Exploring Color Photography: From Film to Pixels. Formica is an Adjunct Professor of Photography and Digital Imaging at York College and New Jersey City University. For more information on the artist, visit www.jenniferformica.com. The Patchogue Arts Council is a 501(c)(3) non-profit corporation founded in 2008 to promote, encourage, and support the arts on the greater south shore of the Town of Brookhaven. The Patchogue Theatre for the Performing Arts is a multi-purpose venue, which offers a variety of events including live performances, films, educational presentations, commercial productions, community forums, and more. Photofauna Floragrams, featuring the artwork of Jennifer Formica, is on display at the Patchogue Theatre for the Performing Arts from November 5 – December 31, 2017. The exhibition is on view during box office hours as well as theatre events and performances. Box-office hours are daily from 12:00 – 6:00 PM. For a complete list of events and performances, visit www.patchoguetheatre.org.